Experts from TUNRA Bulk Solids, the Centre for Bulk Solids and Particulate Technologies and Zhejiang Construction Engineering Group, examine various conveying models for air-gravity conveyor flows. Air-gravity conveyors, commonly referred to as air-slides, are widely used in industry to convey bulk materials with the advantages of low particle velocities, low levels of particle attrition, potentially very high conveying rates and low power consumption. Most current designs are based on empirical design charts and past experience as there have been relatively few investigations attempting to model the flow of aerated powders on air-gravity conveyor systems. 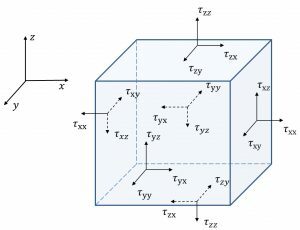 In this paper, ANSYS FLUENT has been used to simulate the air-gravity flow, where a steady, three-dimensional fluidized granular flow is considered in a rectangular channel having frictional side walls for different flow conditions. The results of simulated bed heights along the air-gravity channel are discussed. Moreover, this paper reports on work which attempts to develop a fundamental conveying model for air-gravity conveyor flows in inclined channels with an emphasis on the conservation of momentum taking into account the rheology of the gas-solid mixture. The conveying model shows the relationship between mass flow rate and bed height. The developed model well predicts the steady flow bed heights for each mass flow rate. A sensitivity analysis has been carried out which demonstrates that the conveying model can be applied to powders in a fluidized state to predict the bed heights of the flow under inclination angles between 1° to 10°. Air-gravity conveyors, commonly referred to as air-slides, are widely used in industries now to convey bulk materials with the advantages of low particle velocities, low levels of particle attrition, potentially high conveying rates and low power consumption. Powdered materials, like cement, alumina, plastic metal powders, soda ash, coal dust, flour, resins, etc., have already been conveyed successfully in industries using these systems [1, 2]. Several early investigations of air-gravity conveyors were carried out three to four decades ago [3-7]. Botterill et al. determined the rheological behaviour of fluidized bauxilite by using a modified Brookfield viscometer in a closed-circuit open channel. The fluidised solids conveying experiments  in a channel with a porous tile distributor base also showed the expected rheological behaviour. These studies established that the fluidised solids in an air-gravity conveyor are likely to exhibit rheological behaviour. Therefore, the measured parameters for this behaviour of a given material can be used as material properties to develop model describing its flow behaviour in an air-gravity conveyor. Some research has been conducted to investigate the effects of operating parameters experimentally and theoretically. Gupta et al [8, 9] investigated the influence of the operating parameters on the material mass flow rate and bed depth at a range of conveyor inclinations. An empirical correlation was proposed by Gupta et al  to predict the performance of the air-gravity conveyor, which showed a good agreement with the observed material mass flux. Recently, Savage and Oger [11, 12] reviewed the selected experimental studies of air-gravity conveyors and developed a model to predict air-gravity flows. Their study was the first successful attempt to model air-slide flows that considered the detailed mechanics of fluid-particle interactions and three dimensional flows. The predicted velocity profiles had parabolic shapes that were in good agreement with the previous experimental results. The bed height along the airslide flow channel, however, which is also a very important factor in industrial design, was not included in their study. The current designs of air-gravity conveyors are usually based on empirical design charts and past experiences. Therefore, there is a need to conduct further research into the factors in a downward slope air-gravity conveying system that can assist system design. This study aims at providing a fundamental understanding on air-gravity flow behaviour with an attempt to predict the bed height using three-dimensional CFD analysis as well as the development of a mathematical conveying model. In this study, the air-gravity conveyor data from Tomago Aluminium was used for the verification of CFD simulation. Also, the fluidised bed bulk density and material rheology property, which are required for the determination of bed heights in the development of mathematical model, can be tested using the following techniques. The air-gravity conveyor data was based on Tomago Aluminium Report #7792-R1, which was commissioned by Tomago Aluminium to provide an assessment of four existing air-gravity conveyors used to transport fresh and fluorinated alumina. The fluidised bulk density of fresh alumina was 921 kg/m3, with an average particle size of 70 μm. Fresh alumina was fed into air-gravity conveyor by means of a chute and it was a vented system. The length of air-gravity system was 53.8 m, the square cross section was 120×120 mm and the inclination angle was 3.0° to the horizontal. There were four test points (Test Point 1 at 90 mm, Test Point 2 at 1590 mm, Test Point 3 at 3090 mm and Test Point 4 at 4590 mm) to measure the bed height of alumina along the channel at the first five meters. For the calculation, the initial bed height was considered equal to the bed height at Test point 1 (90 mm). The fresh alumina test data was used to compare with the CFD simulation results. The fluidised bulk density is determined by the apparent bulk density when a material is in the fluidised state. The technique to measure the bulk density was derived from a typical fluidisation test. The experimental apparatus used to conduct the measurement is schematically shown in Fig. 1. Air from the compressor was fed into a flow controller regulating the air mass flow rate from 50 mL/min to 30 L/min. A polyethylene porous sheet (mean air permeability of 10.9 m3/min) was placed between the air and the testing powder. Two pressure taps at a fixed distance (145 mm) were used to measure the differential pressure across the material bed via a differential pressure transmitter. The pressure results were stored in a computer through a data logging device. 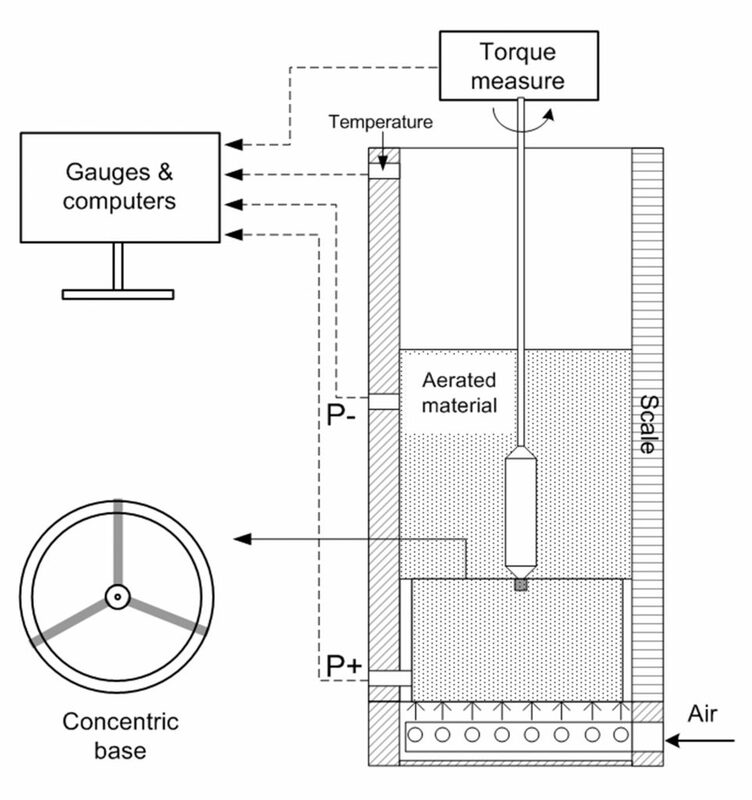 The experimental apparatus shown in Fig. 2 was used to conduct the rheology tests. It was designed by combining a fluidisation apparatus with a rotary viscometer. CFD was employed to simulate air-gravity flow, and this study included the steady, three-dimensional fluidised flow in a rectangular channel having frictional side walls at different flow conditions. Eulerian model was used in the simulation. Parameters, like solid shear stresses, solid pressure, radial distribution function and granular temperature, were considered. The simulation started with a given mass flow rate of granular material at the inlet. Meanwhile, air came from the bottom of the channel bed at the fluidised velocity to fluidise material. The gravitational forces initially accelerated the flow down the inclined channel and then the velocity and solid concentration profiles gradually evolved. The frictional stresses on the sidewalls tend to resist the motion and the flow in the channel will reach an equilibrium state when the frictional wall stresses are in balance with the gravitational forces in the streamwise direction. This state corresponds to a fully developed channel flow where the bed depth remains constant. The CFD computations of the fluidized granular flowing down inclined channels were carried out by considering a 12 m length channel with a 120×120 mm square cross-section based on the data from Tomago Aluminium report #7792-R1. The use of 12 m channel length in the simulation instead of the original length of 53.8 m was to reduce the computational time. Also, this length is 100 times of the channel height, so that it may be assumed to be long enough to reach a reasonable steady flow. The results for solid volume fraction on the longitudinal plane are shown in Fig. 3 for the mass flow rate of 4.31 kg/s. Alumina had a higher solid volume fraction at the bottom part of channel compared to the upper part as the flow progressed. It also shows that the solid volume fraction at the end of the channel was about 0.25, and the bed height decreased along the channel until it reached a relative constant depth. The CFD results are in a reasonable agreement with the measured bed heights as shown in Table 1. It has been found that the solid volume fraction profiles are comparable for varying mass flow rates. The boundary of material bed can be defined as where the volume fraction is equal to 0.2. Table 1 lists the bed heights predicted by CFD simulation as well as the measurements at four test points. It can be seen that the height of alumina bed decreased along the channel with a sharp decrease at first meter and a slight drop at following two meters for all the three mass flow rates. 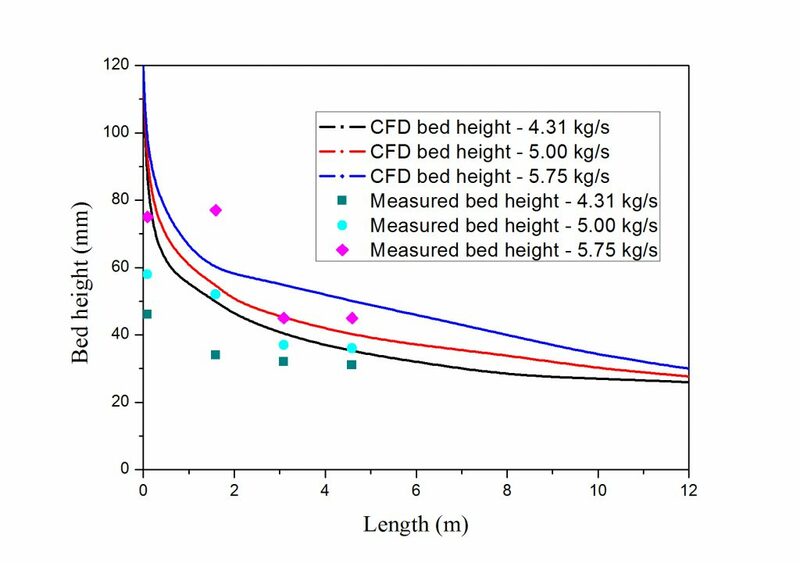 The bed heights estimated by CFD at the first point were higher than the measurements. The reason is that in CFD simulation a full bed height at the channel inlet was used for all the cases, which was higher than the onsite bed height at inlet. For the mass flow rate of 4.31 kg/s, the simulated bed heights were 65 mm at Point 1, and reduced to 40 mm at Point 2. The bed heights continued to decrease and reached 35 mm at Point 4. The slowly decreasing trend of the bed height was in accordance with the onsite experimental data. The simulated results for the other two mass flow rates (5.00 kg/s and 5.75 kg/s) also followed the similar trend. The CFD predicted bed heights along the channel length and the onsite measurements are plotted in Fig. 4, where a good agreement can be observed. The CFD results show that the bed heights at 12 m were 26.0, 27.7 and 30.0 mm for mass flow rate of 4.31, 5.00, and 5.75 kg/s, respectively. It can be derived that the bed height within 12 m channel length did not reach the constant values. The increased length will be required to obtain the final bed height in CFD simulation, however, this would result in the greatly increased computational time and cost. Therefore, an advanced mathematical conveying model needs to be developed to predict the bed height for a steady flow (a constant bed height). A mathematical conveying model for air-gravity conveyor flows in an inclined channel is to be developed based on the conservation of momentum considering the rheology of the gas-solid mixture. This model will demonstrate the relationship between mass flow rate and bed height. where 𝜌 is material bulk density, t is time, P is the pressure, 𝑣𝑥, 𝑣𝑦 and 𝑣𝑧 are velocities at x, y, z directions, respectively. 𝜏 is shear stress, and the usual suffix notation 𝜏ij is applied to indicate the direction of stresses, as shown in Fig. 5. The surfaces i and j in 𝜏ij indicate that the stress component acts in j-direction on a surface normal to i-direction. For the vented system (the top covers allow for effective venting of the air that filters through the material that is being conveyed), the driving pressure gradient term in Eq. (2) for the fully enclosed flow can be replaced by a term that physically corresponds to the streamwise gravitational component of the particles weight, i.e. embodies a power-law correlation; 𝜂𝜌 is consistency; 𝑏𝜌 is the flow index, which can be expressed as a function of density and determined by the rheology tests of the aerated material. At 0 < z < H, the velocity distribution of the flow can be solved by integrating Eq. (2) and Eq. (3) with the boundary conditions: 𝜏zx= 0 at z = H and 𝑣𝑥= 0 at z = 0. However, the density used in conveying test was 921 kg/m3 rather than 825 kg/m3 in Chen’s study . The appropriate adjustment, i.e. application of the offsetting values with a constant slope, has to be made as it can be assumed that alumina may have same rheology behaviour. Then, the corresponding properties for the material used in the onsite tests can be derived. In Eq. 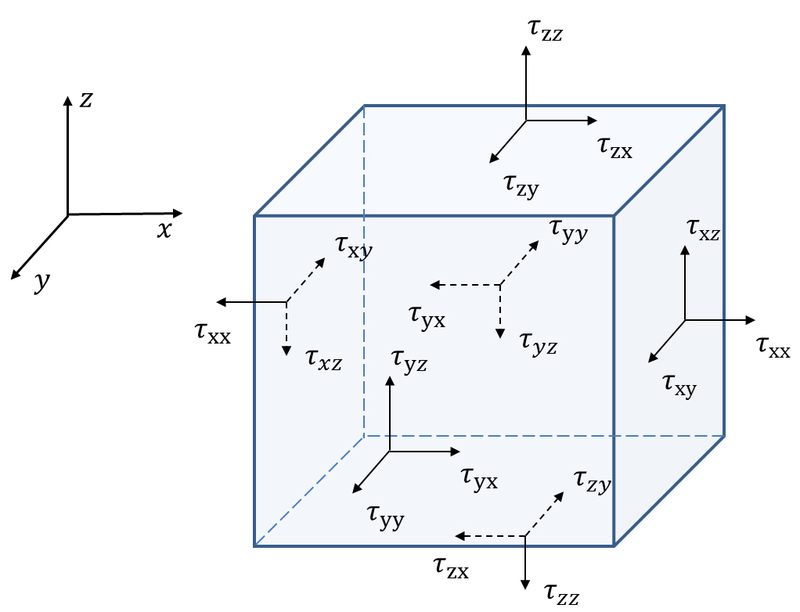 (4), the velocity distribution (𝑣𝑥) was assumed to follow the power-law fluid conveying model. By applying Eq. (5), the steady flow bed heights for each mass flow rate can be obtained. A constant velocity and bed height can be achieved when the frictional wall stresses are in balance with the gravitational forces in the streamwise direction. For each given flow rate, the corresponding bed height has been calculated using the proposed model. Table 2 lists the model and CFD results obtained from the end of air-gravity channel. The calculated constant bed height was 24.9 mm at the mass flow rate of 4.31 kg/s, while it increased by 1.1 mm when the mass flow rate increased to 5.75 kg/s. It was found that the bed heights predicted by this model were lower than the CFD results. This is because the simulated bed height by CFD did not reach the constant value due to the use of shorter channel length than required for steady flow. This indicates that if the flow in CFD continued to progress, the difference in the results between conveying model and CFD simulation would be reduced. The estimated bed heights by conveying model at various bulk densities of 850 – 921 kg/m3 are shown in Fig. 6. Three mass flow rates had a similar decreasing tendency with the increase in bulk density. 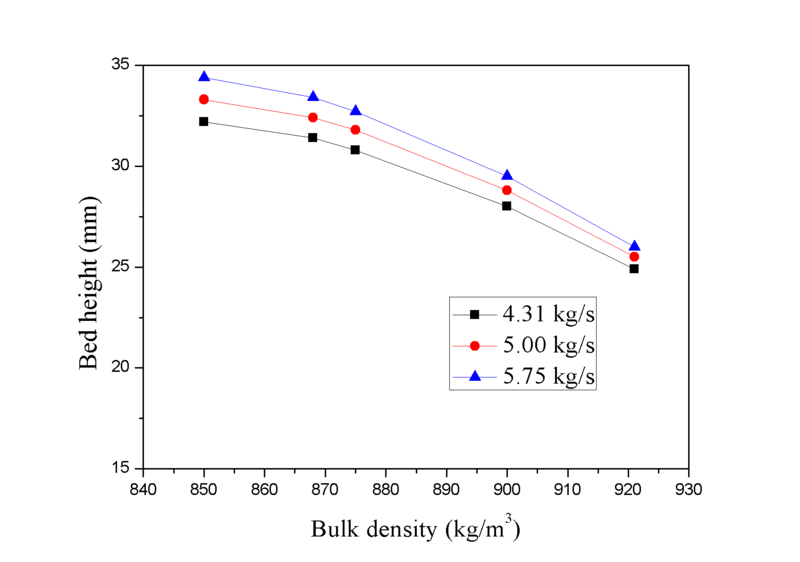 For the mass flow rate of 4.31 kg/s, the bed height decreased from 32.2 mm at 850 kg/m3 to 24.9 mm at 921 kg/m3, which in consistence with the empirical relationship between bed height and bulk density. Also, for each given bulk density, the bed heights increased with increasing the mass flow rate, which shows that the proposed conveying model can provide the satisfied results at the well-fluidised state. However, the excessive bubbling existed at a bulk density of lower than 850 kg/m3 due to the largely increased air velocity, which would reduce the accuracy of the conveying model. Therefore, the conveying model developed in this study may not be suitable for the excessive bubbling condition. Fig. 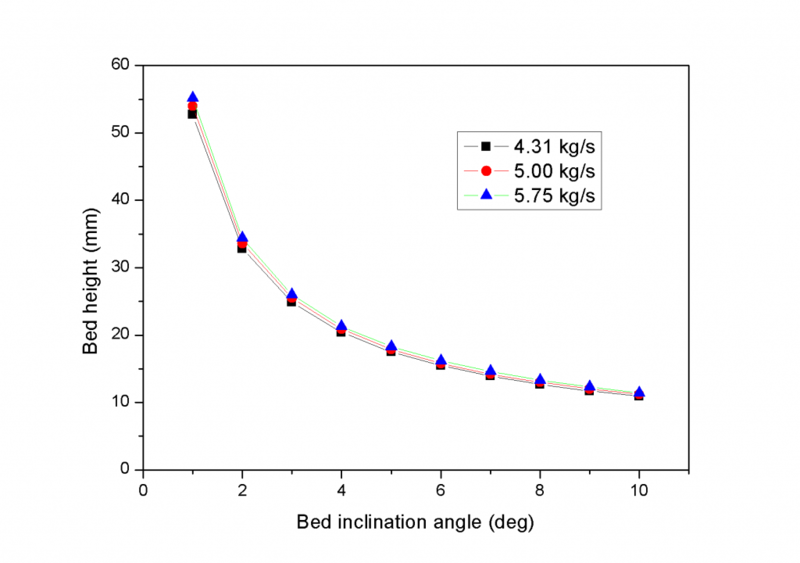 7 presents the bed height results as a function of inclination angle. It can be seen that the bed height exponentially decreased while the inclination angle increased. For the mass flow rate of 4.31 kg/s, the bed height reduced from 52.7 mm at 1° to 10.9 mm at 10°. At each inclination angle, a higher mass flow rate resulted in a higher bed height. This study provided a fundamental understanding on air-gravity flow behaviour with an attempt to estimate bed height using three-dimensional CFD analysis as well as the development of a mathematical conveying model. CFD analysis was used to simulate the air-gravity flow well for various flow conditions. The simulated bed heights along the air-gravity channel gave the reasonable depictions of the observed flow behaviour. A fundamental conveying model for an air-gravity conveyor flow in downward inclined channels was developed based on the conservation of momentum, taking into account the rheology of the gas-solid mixture. The model described the relationship between mass flow rate and bed height. The bed heights at steady flow state were well predicted using the conveying model for each mass flow rate, and the material bed heights increased with the increase in mass flow rate. A sensitivity analysis demonstrated that the conveying model can be applied to powders in a fluidised state to predict the bed heights of the flow under the inclination angles between 1° to 10°. Additional studies on air-gravity conveying experiments with other materials are needed to further develop the conveying model, and the velocity distribution can be measured to improve the CFD simulation. 1.Centre for Bulk Solids and Particulate Technologies, The University of Newcastle, Australia. Zhejiang Construction Engineering Group Co.,Ltd. Hangzhou, Zhejiang, China. 3.TUNRA Bulk Solids, The University of Newcastle, Australia. The authors gratefully acknowledge financial support from Chinese Scholarship Council. C.R. Woodcock and J.S. Mason, Bulk Solids Handling – An Introduction to the Practice and Technology, Blackie and Son Ltd, 1987. D. Kunii, O. Levenspiel, Fluidization Engineering, Krieger. Huntington, New York, 1977. J.S.M. Botterill, M. van der Kolk, D.E. Elliot and S. McGuigan, The flow of fluidized solids, Powder Technology 6 (6), pp. 343-351,1972. J.S.M. Botterill and D.J. Bessant, The flow properties of fluidized solids, Powder Technology, 8 (5-6), pp. 213-222, 1973. J.S.M. Botterill and D.J. Bessant, The flow properties of fluidized solids, Powder Technology, 14 (1), pp. 131-137, 1976. J.S.M. Botterill and B.H. Abdul-Halim, The open-channel flow of fluidized solids, Powder Technology, 23 (1), pp. 67-78, 1979. B. Singh, T.G. Callcott and G.R. Rigby, Flow of fluidized solids and other fluids in open channels, Powder Technology, 20, pp. 99-113, 1978. S.K. Gupta, V.K. Agrawal, S.N. Singh, V. Seshadri and David Mills, An experimental investigation on a fluidized motion conveying system, Powder Technology, 167, pp. 72-84, 2006. S.K. Gupta, V.K. Agrawal, S.N. 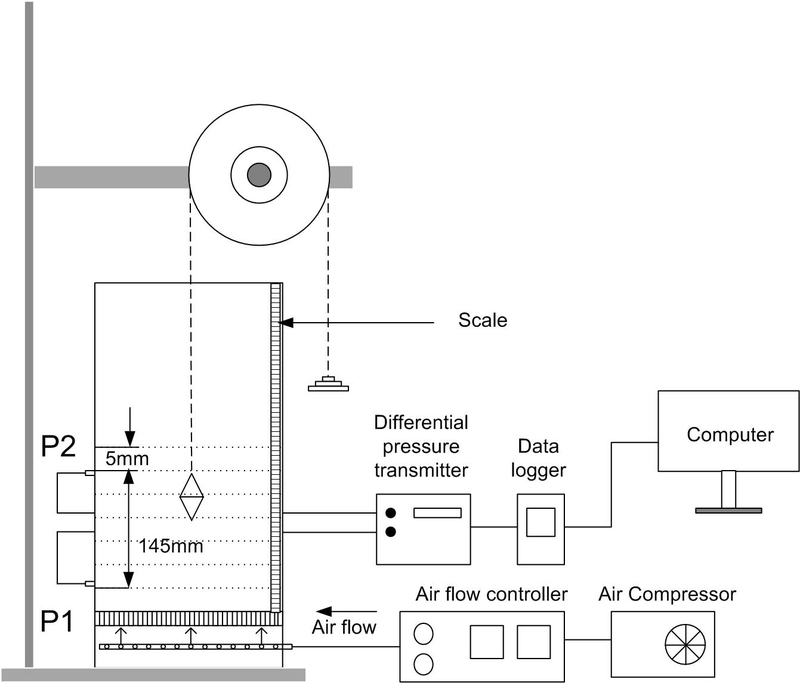 Singh, et al., Parameters Affecting Fluidized Motion Conveying of Fly Ash, Particulate Science and Technology, 27, pp. 469-487, 2009. S.K. Gupta, V.K. Agrawal and David Mills, A model for fluidized motion conveyor transporting fly ash, Experimental thermal and Fluid Science, 34, pp. 1042-1048, 2010. S.B. Savage and L. Oger, Airslide flows, Part 1 – Experiment, review and extension, Chemical Engineering Science, 91, pp. 35-43, 2013. L. Oger and S.B. Savage, Airslide flows, Part 2 – Flow modelling and comparison with experiments, Chemical Engineering Science, 91, pp. 22-34, 2013. W. Chen, The rheology of aerated fine powders: theory and application in pneumatic conveying systems, PhD Thesis, The University of Newcastle, Australia, 2013. C.D. Han. Rheology and Processing of Polymeric Materials: Volume 2: Polymer Processing, Oxford University Press, 2007.